She woke up, got dressed, and went to pick up her photos from the fair. After spending some time speaking with the man in charge of the photography contest/exhibit (and posing for her photo with her Best of Show winner), she turned with a new found sense of pride and headed out the door, when she heard the gentleman say, "Get out of here and get out there to get some more great photos!" "Oh yes." she thought, "That is exactly what I'm going to do." On the way back from the walk, returning to the house, she thought to herself, "Well, it was a nice walk anyway. I got some decent shots... nothing spectacular, but I certainly enjoyed myself." Then, she heard a voice (please don't call to have her committed) which said, "Look UP... NOW!" Honestly, this 'voice' was so apparent that she actually responded with "Huh?". Then... she heard a sound. "WHOA - she really IS coming straight for me!" "Brace yourself, Mist, cuz this might hurt a little bit." "What the? Where the heck did this human-chic come from?!?!" she makes my ear twitch." she thinks I'm beautiful or something." "Yep, I'm concluding that this human-chic isn't too much of a danger." she needs to start breathing again." "Oh well, I'm off now. I think I just made that chic's day!" Perhaps she had an important meeting to discuss how to create quality Dallas resumes. Whatever it was, she needed to get there fast. Do you want to join the Weekend Meme all about animal/critter photos? Clicking on the post header graphic will take you to the blog where you can sign in if you have made a post, and you can visit other Camera-Critters Captures. Or, clicking HERE will take you to the rules. 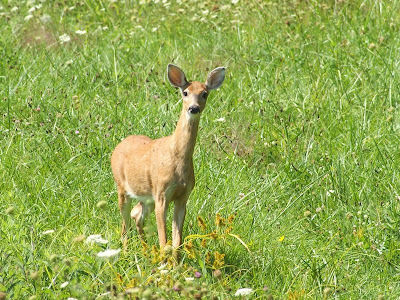 What a wonderful shots of the deer! Looks like there's a lot of deer around your places. Great capture btw! Wow, Misty! That was some experience! Beautiful shots too! Gorgeous! What a wonderful experience! Lovely experience and great presence of mind to keep clicking away. That had to be an amazing experience. The excitement of having something like that happens seems to stay with you forever. Congratulations on your "Best of Show", at the fair and thanks for sharing the experience with the whitetail fawn. They are truly captivating creatures. those shots were amazing!!! how close were you? thanks for visiting, and blackie still says "no thanks" to being friends with a dog..
Too cute! What a wonderful experience. Nice shots! That is great, you got all lovely shots. Oh my, what a great piece of luck! I really envy you! Me and my frogs in this country. I just wanted to give you a heads-up, since you specifically asked for info: Cody has been adopted! I'll put more information up on the Pooch Page on the 17th (I think that's when I have his next picture queued up for), but I thought I'd just let you know! 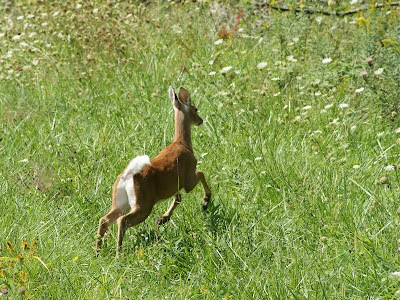 Awww the little fawn is frolicking! Too cute!! Ohh, a close encounter to die for! But I'm glad you didn't. Wonderful shots of the deer and the sky watch. I like how you told the story as well. And yes it stinks that the geese had a party at my place and left me out. Isn't it great to be able to experience something like this and photograph it as well? Thanks so much for sharing this! Misty: Cool captures of the deer, what a great photo opt. Wonderful photo essay, Mist. Thank goodness you had your camera with you. What a wonderful series of pictures! Oh my good golly aunt. I am in tears. Literally in tears for you my friend. That is the BEST opportunity and you took it. Well done. Beautiful shots. How on earth did you stop from shaking and stay focused?? That was a beautiful experience. Nice photos! Love the shots and it would make my day too. Beautiful pictures! That deer is so pretty. Wow, it must be nice to spot a wild deer. Great shots Misty. 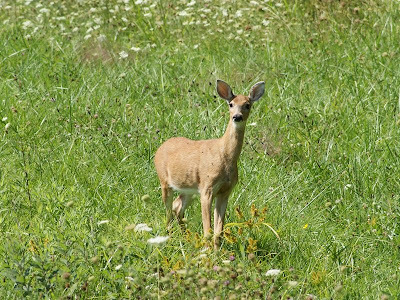 Deer are abundant here, and I love to watch them. Great shots! what a wonderful story. she's a beautiful deer, too! thanks for sharing. 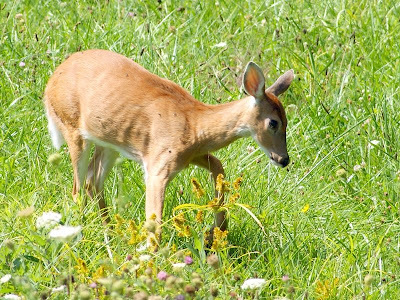 is the deer wild or something or some neighbor's pet? Wow! What an exceptional experience! Your photos and text are so perfect that I felt as if I was there and living the same moment! Thank you! 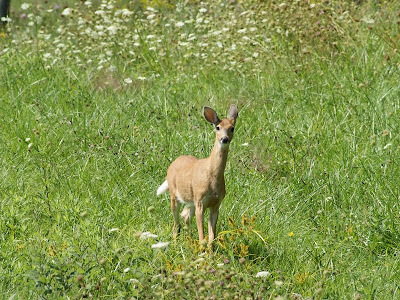 What fantastic pics and loved how you walked us through the experience of facing a deer in the wild! Way cool! That must have been some experience! Good that you kept your hand on the shutter button! Glad you didn't get run down! Great shots. Love the deer shots. 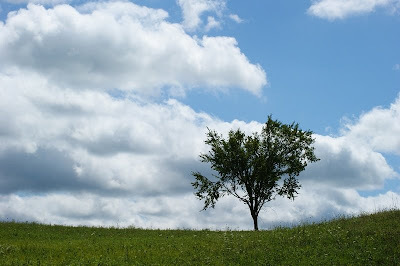 The sky with the lone tree is very enchanting as well. Yeah, I think I REALLY have to start carrying my camera around with me more. Fantastic series. 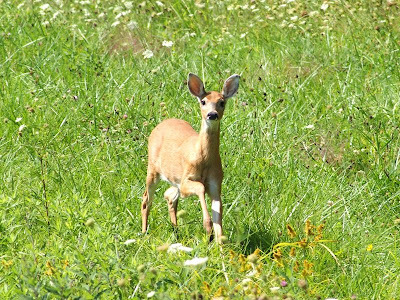 Whitetail deer are fun to watch. I'm loving the one of the tree too... it would make a fantastic desktop!! You lucky girl ! what a catch ! and a cute story with it, lol ! This is the reason we take our cameras with us everywhere we go! 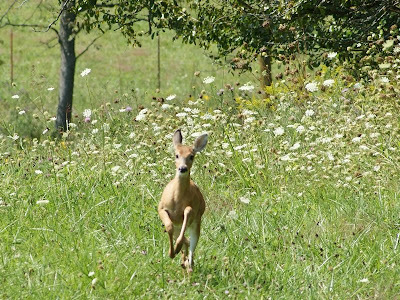 What an AMAZING series of photos and you were so lucky to capture that beautiful little deer! Congratulations on the Best Of Show ribbon - it was definitely well deserved! looks like the deer was really posing for a shot! great shots! What an incredible sight. & you've captured it for all of us! She's just beautiful. Beautiful! Ike kept me from participating this week - I'll be back to CC this weekend! Create a personalized gift at Zazzle. Share book reviews and ratings with Misty, and even join a book club on Goodreads. This is a Flickr badge showing public photos from MistyDawn. Make your own badge here. Everyone LOVES my Moo business cards! Their quality is the best! What does it really mean to be a professional photographer? Readers didn't want to learn the martial art from the novel you write. No need writing cultivation in details. Did I fall into Wonderland?